The ABAC program allows Aboriginal students to study business at the Edwards School of Business without committing to a four-year degree program. The two-year certificate of proficiency incorporates significant student success activities designed to assist students with their transition to studying business in an urban university setting. Students also have the opportunity to upgrade their high school math after admission to the program. If you are interested in a program at the U of S that requires Foundations of Mathematics 30 and/or Pre-Calculus 30 (Grade 12 MATH B 30 and/or MATH C 30), the Rawlinson Centre can help you upgrade while taking courses in the ABAC program. 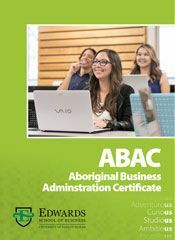 One of the most frequent questions asked by students is "how much will the Aboriginal business certificate cost?" In 2018-19, students in the ABAC program will pay $839.10 per 3-credit unit COMM class. Tuition for electives is dependent on the courses you choose. For current tuition information, visit the U of S tuition website. All certificate students must pay on-campus student fees. These fees are subject to review and revision at any time and are non-refundable after the add/drop deadline for a given term. Textbook expenses vary depending on the requirements of each course. Generally students should expect to budget between $100 and $200 per class for texts and materials.